Now days the growth of messaging app has been faster than everyone’s expectations. The main reason behind this is potential for messaging as a platform is virtually unlimited. In the enterprise messaging space, business messaging apps like Slack offer more than basic workforce communication. Especially for business better communication messaging apps work like a fuel for the growth of businesses. Here we are going to discuss about the benefits of messaging apps and how these benefits re framed communication process in different platforms. WhatsApp ranked the highest with 1.48 million downloads. And that’s just for February 2018. Ranking fifth was Facebook’s very own Messenger, with over 830,000 downloads. This is the USP of messaging apps. If you are running your business remotely then it become very important to stay in touch with your team members. It create the feeling of being part of a team. Here business messaging apps play a very crucial role. Messaging apps make it easy for your employees, no matter how far around the world they are,to stay in touch with you, and for you to keep tabs on them.This is one of the most popular reasons why business owners reach for business messaging apps. It bridging the gap of time and space and making sure that all your employees are working exactly the way you want them to. Another interesting feature of messaging app is digital payment. With the popularity of messenger apps this feature will give a boost to digital payments. Sending money or making payment has become as easy as sending SMS. Monetizing messengers is in experimental stage, but some apps are making progress in the course. Example – WeChatPay application is used to transfer money between WeChat users (peer-to-peer) and make payment online and with participating offline retailers. Messaging app is great platform for making use of chatbot. It has higher open rates compared to email due to interactive and spontaneous response. It can solve customer queries in real time. It can use videos and images or a character to keep customers engaged. Deliver smarter and better engagement with the customers. Customers can make payments with chatbot without leaving the messenger app. More and more companies are implementing chatbot to improve their customer experience. Personalised customer service with chatbot helps to aim target customers when messenger is used as marketing tool.By considering the opportunities and possibilities that chatbots brings in, businesses are counting up on them to improve their customer service. Here are some best practices for deploying chatbots for your business. It is important to identify the tasks that a chatbot is expected to do. By doing this you can determine the purpose for which you want your customer to turn to the chatbot. Remember that the goal of a chatbot is to set a seamless connection between the business and the customers. Choose a platform for your chatbot where you are likely to find users, well-suited for your business. 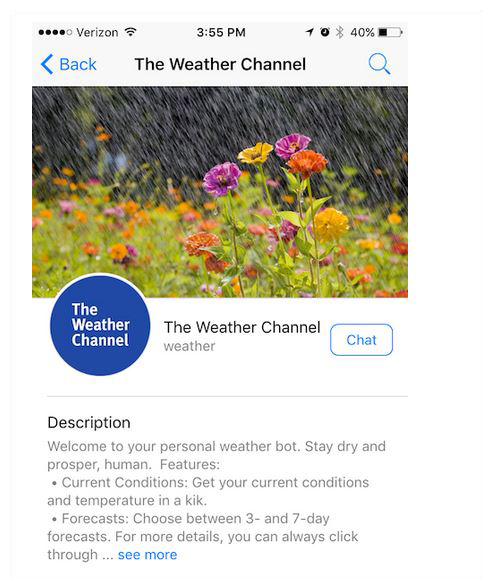 Example – Messaging app Kik already has a full blown bot shop where you can find bots for H&M or the Weather Channel. Targeted audience will be directed to the preferred destination like company website or a messenger chat. For better engagement you can add video or audio or a product link with text message. Companies can reach out to target customers one on one. Example – Snapchat is an innovative example for delivering different type of content to their consumers. 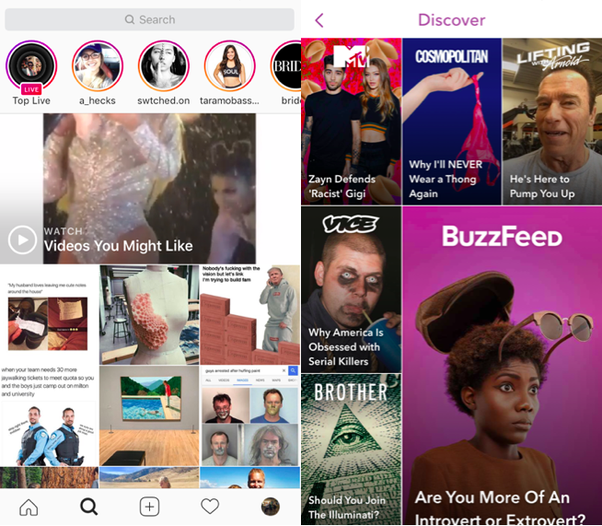 Some popular publications like Cosmopolitan, vice magazine have channels on Snapchat featuring their popular stories from their websites. Their stories giving immediate access within the app. No doubt, that this is a great brand exposure technique for promoting their content. In traditional channels SMS are vulnerable to spam because users have limited ability to control SMS, overload in inbox etc. On the other hand messaging apps, give users a substantial control over who can send message to them. Businesses need user permission before communicating with them, and user can opt in or out at any time. The spammers are locked out of the ecosystem, leading to fewer messages and manageable inboxes. This translates to higher open rates, read rates and CTRs. Studies show that messaging apps have open rates, read rates and CTRs as much as 10 time those of email and SMS. Segmented target advertising is one of the main crucial part of targeting customers. By using instant messaging for business you can share your content either one to one or in a group. Companies take benefit of this feature of messaging apps to enhance their promotional content depending on customer demographics and interests. Example – In WhatsApp the maximum limit of adding people in a group is 256, but you can create unlimited number of groups. The number of targeted people are much smaller but in these small groups you have the most engaging and targeted customers. Instead of publically tweeting a complaint, messaging app allows customers to reach out to company easily and privately. Another benefit to mention is, it also gives a “space” to exchange sensitive customer information like delivery details including personal information like address. Messaging app can be considered as private outlet for customer relationship which gives customized service to customer and saving “brand image” at the same time! You can conduct polls, organize meetings and share files. Offering news feeds according to user tastes. Serving the customers through messaging apps deepens the relationship with customers. To stay ahead in competition, businesses are increasingly employing new technologies to touch base with customers. With the popularity of messengers, it has become a preferred medium of communication channel for businesses.